The market is quietly drifting higher while growth fear subsides and earnings outlook declines. Today's action took the broad market S&P 500 up to retest last week highs and those highs look like they will be broken. Reports after the bell confirm what a broad swath of the market has already told us; earnings are better than expected and the outlook is too. The outlook for 2019 isn't great, but it's positive and not as bad as the analysts had predicted which is enough for now. The generally positive outlook provided by the broad market has been clouded by the energy sector. The energy sector has seen some substantial downgrades to all four quarters due to low oil prices and slow-growth fears. Analysts are now predicting earnings to begin declining in the sector as soon as the second quarter and shrink nearly -6.5% for the year. Just a month ago consensus estimate was closer to +8.8% so you can see how sharp the swing in estimates has been. Missing from the news today was mention of the government shutdown, trade with China, and the FOMC; the three things holding back the US and global economic growth. All three issues remain but all three have been moved to the back-burner in some respect. The shutdown will pop back up first, just after Valentines Day most likely, and could result in another extended showdown between Trump and Pelosi. After that is trade, trade talks are scheduled for later this month that will bring Trump and Xi together. There is optimism some degree of resolution will be reached but how much and how soon is highly questionable. The FOMC is least likely to pop up as a problem in the near-term unless of course there is some noticeable change in the data. Of note. Senators Schumer and Sanders have declared war on corporate buybacks. They say corporate buybacks help the rick and hurt the working man. Corporate buybacks have been a major support for the market over the past almost-decade, their suspension would be a serious blow to the bull market. I understand their point, people who own a lot of shares of a stock benefit greatly from share buybacks, but so do all the 401(k)s and IRAs of the working man. 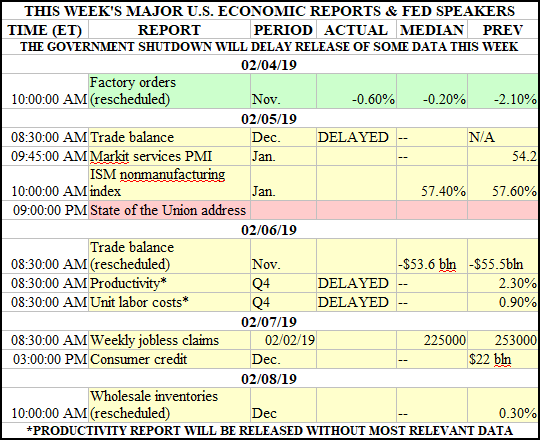 We're starting to get caught up on the data missed during the government shutdown. The current data is, in most cases, still delayed but the old data is being released as its compounded. Today's release is the November read on Factory Orders. Factory Orders fell by -0.6% making the second month of decline. This is not surprising considering the general slowdown in activity we saw in the 4th quarter. 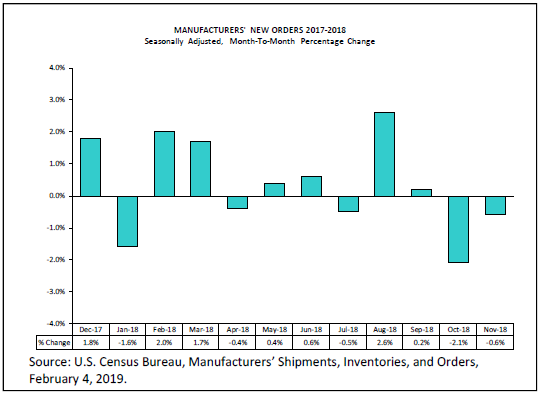 Fresher data, like the ISMs, show business activity continues to expand in 2019. 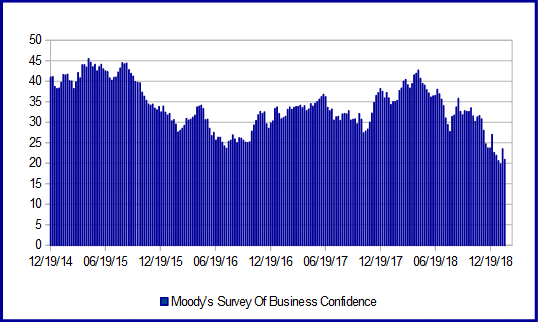 Moody's Survey of Business Confidence fell -2.6 points to hit 20.9 in the last week. This is near the post-crisis low and possibly a bad sign; last week's US/China trade developments, dovish-sounding Fed, and a blowout NFP report were not enough to brighten business sentiment. The dour mood is likely to continue until a concrete end to the trade disputes and/or uptick in the data is at hand. 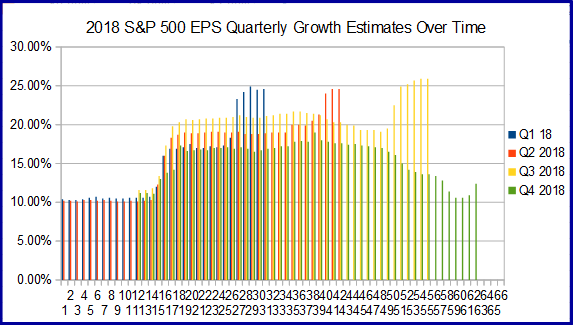 More than 46% of the S&P 500 have reported earnings and the results are OK but not awesome. Awesome would be positive growth for the S&P 500, beating consensus estimates by more than 4%, and improving outlook for earnings the coming year. What we have is positive growth that is beating consensus by less than 4% (4% is average, expected) and outlook is declining. So far this quarter the blended rate of growth is 12.4%. The blended rate will need to increase another 2.1% to be considered â€œas expectedâ€ and more than that to truly beat what the market had priced into stocks. There are 103 reports due out this week, including today's reports from Google, Gilead, and Seagate. Looking forward, the outlook continues to deteriorate and worse, the first quarter consensus has turned negative. Granted, that is due in large part to three sectors but still, negative growth is not what we want to see in a bull market. The sectors hurting outlook are materials, energy, and information technology which have all seen major downgrades in the last 2-3 weeks. All three sectors are sensitive to China, tariffs, or global growth in some way so could rebound if trade relations improve later this month. The bright side to the coin, ever the optimist am I, is that earnings growth for the year is positive and accelerates from the first quarter to the fourth. 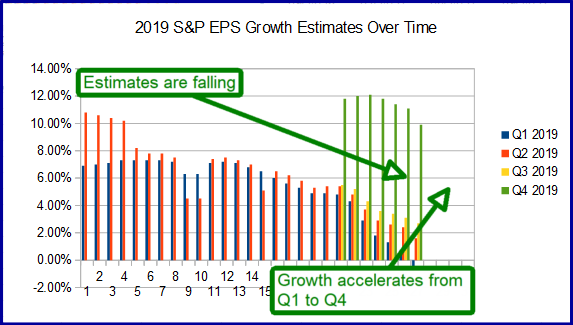 The first quarter of 2019 will be, should be, the bottom of the earnings growth slowdown and a possible turning point for the market. The risk is that outlook will continue to deteriorate and sap gains as we approach said turning point. The Dollar Index moved higher in today's session. 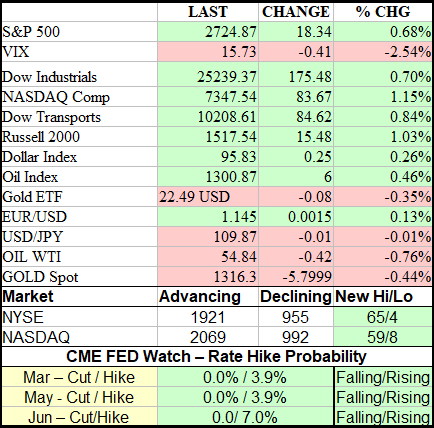 The move was driven in part by last week's blowout NFP report and in part by weaker than expected data from overseas. Data from the UK and EU includes construction PMI, investor confidence, and PPI; all suggest growth continues but at a much slower rate than expected. 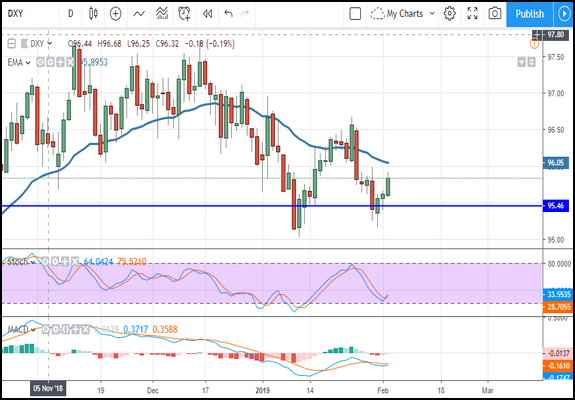 The news is likely to keep the Dollar Index moving up in the near-term but there is potential for resistance at $96.00 and $96.50. Gold prices slipped on today's stronger dollar but the losses were small. The spot price fell about -0.60% but found support midday and regained about half the loss. 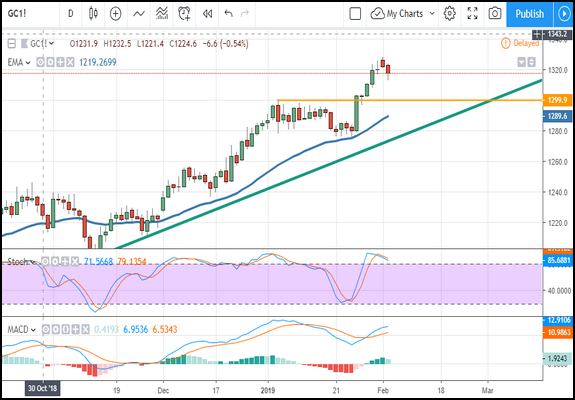 The support is near the $1,218/$1,220 level and may be strong enough to hold provided nothing comes out to stiffen the dollar. If gold prices do move lower a dip to $1,300 is possible. There is not much data this week, at home or abroad, so I expect to see the dollar and gold meander near their current levels. 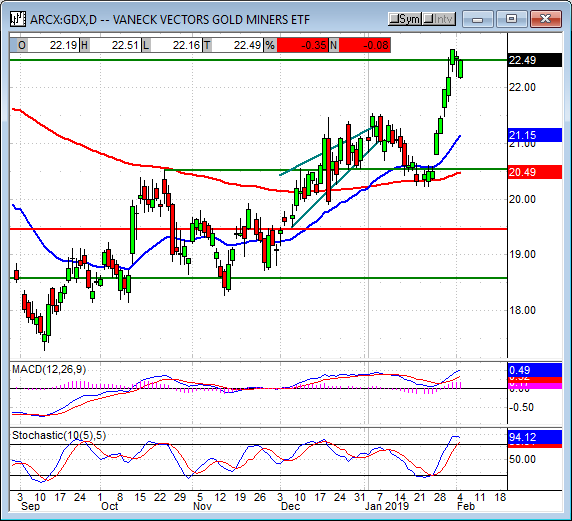 The Gold Miners ETF GDX slipped in today's trading but was able to regain a lot of the lost ground. The ETF closed with a loss near -0.50% but created a green candle which suggests support is present. The bad news is that price is back below the $22.50 level where resistance may become strong. The indicators are bullish so upward momentum may lead prices higher, the indicators are also showing a peak in price action that may indicate consolidation will begin, or the top of a range has been hit. A move up will be bullish if it closes above and then confirms $22.50 as support, a move lower may hit $22.00, $21.50, or $21.00. Oil prices tried to move higher but didn't hold the gain. The price of WTI is being supported by the OPEC production cuts, Saudi Arabia's zealous support of market tightening, and US sanctions against Venezuela but offset by equally important concerns. Oil prices are being weighed down by global growth concerns, stronger than expected data from the Cushing delivery hub, and word from Russia it was in full compliance with its deal to curb output. The news is plentiful and mixed so oil prices may continue to move up and down on a day to day basis. Over the last couple of weeks, oil prices have been creeping higher while they see-saw and look like they will continue to creep higher now. 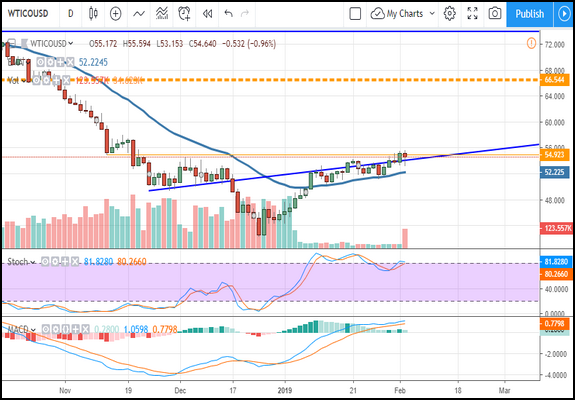 The $54 level has emerged as potential support, so long as daily price action holds above that level a test of $56 and then $58 looks possible. The Oil Index was able to move higher in today's session but the gains were small and capped by resistance. The index is supported by strong reports from the energy sector but uncertainty in oil prices is keeping it from moving higher. A move up would be bullish and is supported by both indicators although there is some risk, resistance is just above today's closing level and could keep the index from moving higher. Resistance is just above 1,300 at a previous support level, a move above that may go as high as the long-term moving average. I am bearish on this sector because earnings growth outlook is the worst of any for the sector, has fallen hard over the last few weeks, and not likely to improve while oil prices are aimlessly moving sideways as they are. Papa John's got a boost from news Starboard Value had taken a stake in the company. Starboard will invest $200 million in the pizza chain with an option to invest another $50. The deal includes the addition of two new members to the board of directors, one from Starboard and one independent, that both have experience with ailing hospitality properties. The independent director is former Pinnacle Entertainment CEO Anthony Sanfilippo. Papa John's accepted the offer in favor of one offered by John Schnatter, his deal included peace offerings like limited voting rights and a reduced dividend payout, and erases any doubt of his standing with the company following his series of missteps. Google parent Alphabet reported after the closing bell to mixed applause. The company reported revenue grew in all segments that count, net revenue grew 21.5% YOY, and EPS of $12.77 beat the consensus by $1.91. Shares were first up 2.0% in after-hours trading and then fell -2.0% as traders began to digest the report. One area of concern is operating income and operating margins which both fell short of consensus. The bite into margins comes on the back of falling prices for advertising rising costs so not an easy fix. 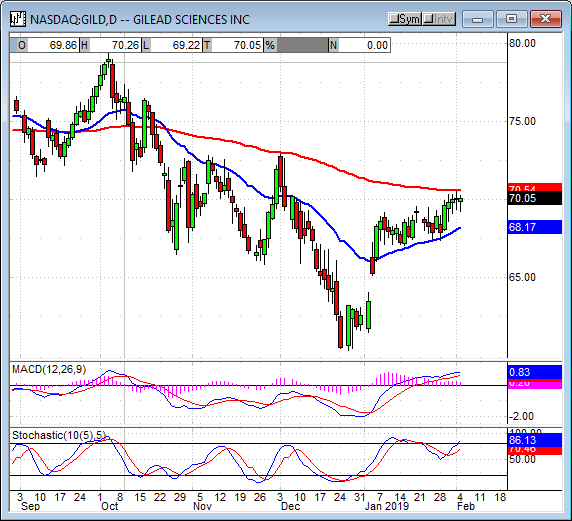 Gilead Sciences reported after the bell and also saw its shares fall in after-hours trading. The company reports revenue fell -2.6% on weakness in key drugs Harvoni and Epclusa (both Hep C). Sales of both drugs are declining double digits and will weigh on growth in coming quarters. Forecast for 2019 revenue is on the light side of consensus, $21.3 to $21.8 billion, and helped drive shares lower. 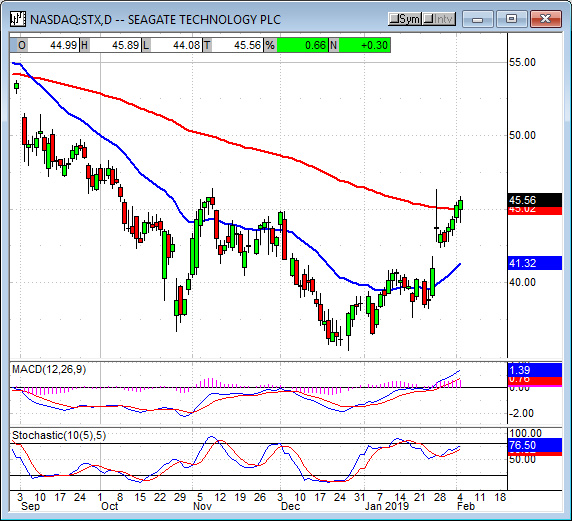 Memory chip-maker Seagate Technology reported after the bell and beat expectations. The most notable surprise is that capacity declines are less than what the market had been expecting which suggest demand isn't as weak as some had forecast. Revenue was only in-line with consensus but EPS beat and the outlook is brighter than forecast so shares advanced 3.0%. The indices were subdued during the day's session, hopeful, but subdued as traders waited on earnings scheduled for after the bell. 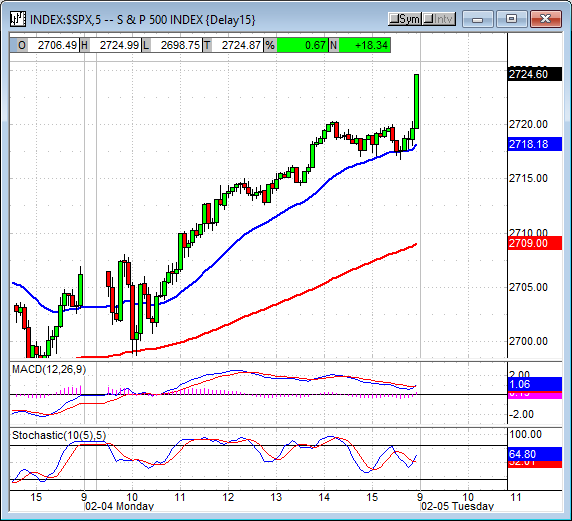 A late day surge, in the last five minutes of trading, took the indices up to the high of the day. The broad market S&P 500 index lagged today's session with a gain of only 0.67%. 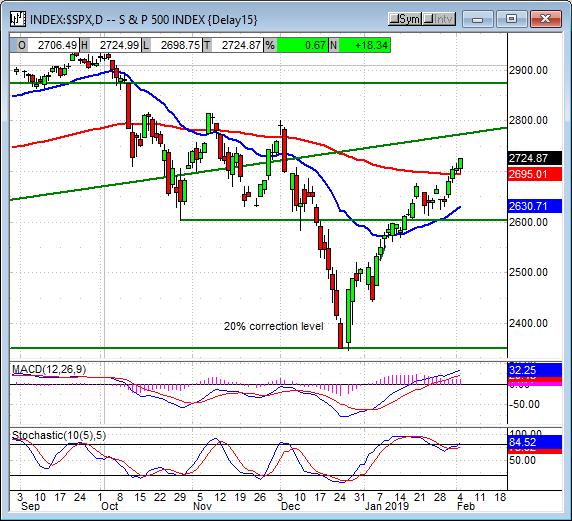 The index created a small, green-bodied candle that moved up to set a new high so is bullish if tentative. The indicators are showing bullish activity that is consistent with higher prices so a move up from this level is expected. 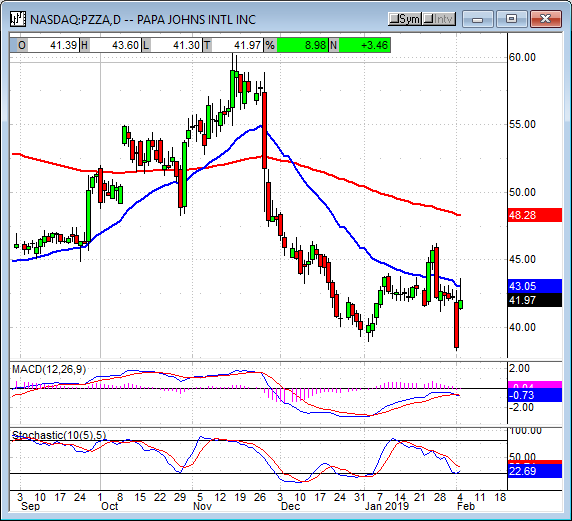 Because the moving average is acting as support there may be some strength in the move if it does come. My next target for resistance is 2,750 and then 2,800 in the near-term. 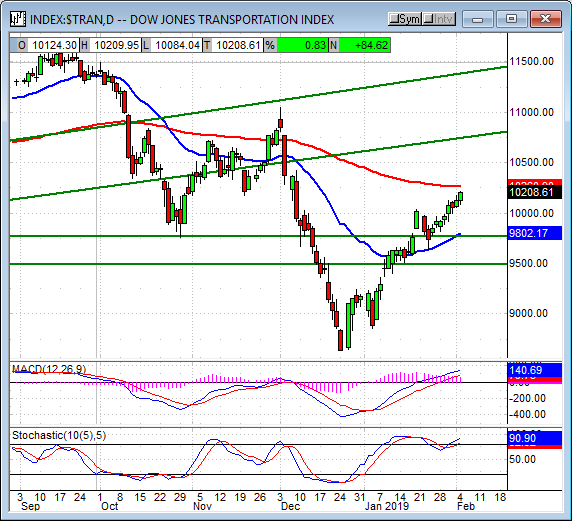 The Dow Jones Transportation Average advanced close to 0.90% in today's action and created a small green-bodied candle. 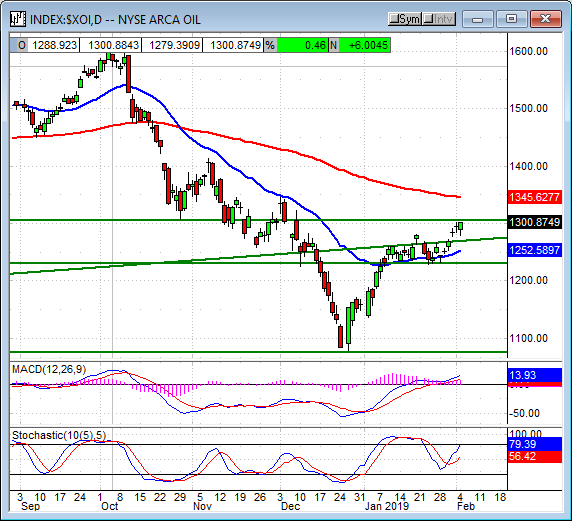 The index set a new high with the move and is approaching resistance but there is still some room for it to run. A move up may find resistance at the long-term moving average near 10,250 or 10,500 if the EMA is surpassed. The indicators are bullish so a move up to test the EMA is expected, the indicators are not showing a lot of strength so a move above it is questionable. 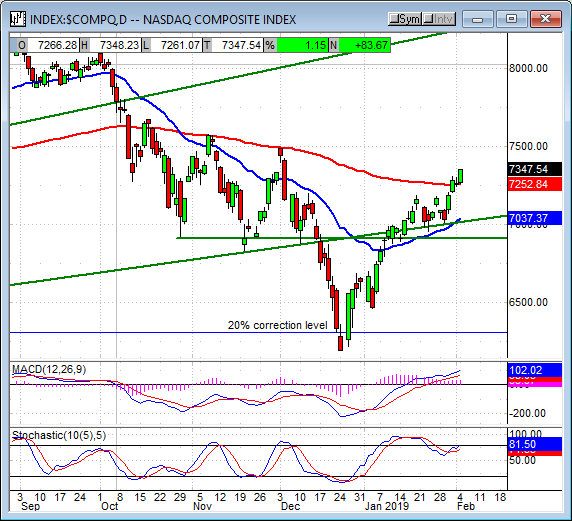 The NASDAQ Composite led today's market higher with a gain near 1.15%. 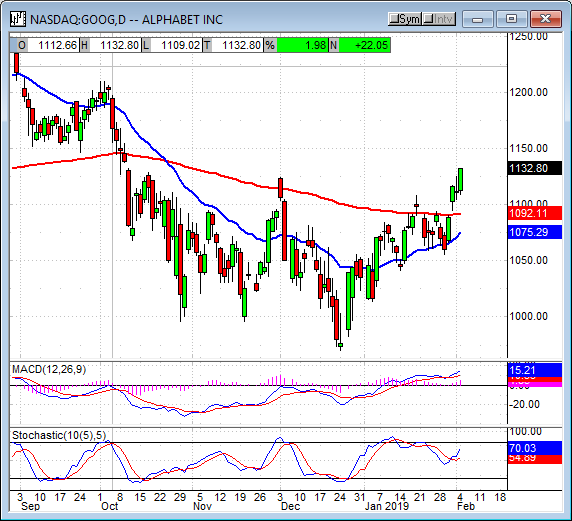 The tech-heavy index was supported by earnings hopes for Google and others, and the market was not disappointed. Today's action confirms support at the long-term moving average and, quite possibly, the resumption of the long-term bull market so upward movement is still expected. 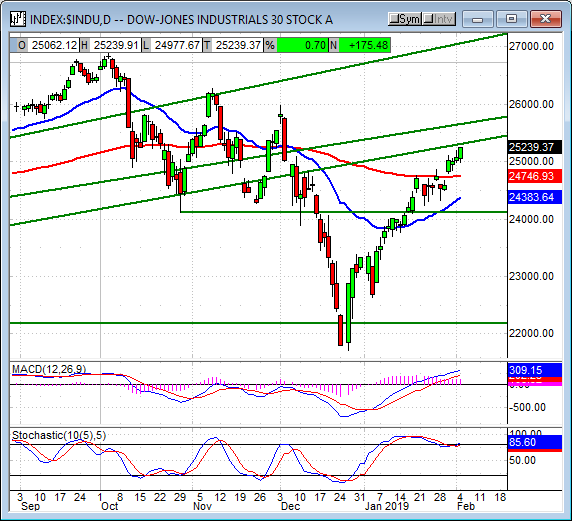 The indicators are bullish as well and support a move up to 7,500 or higher. The Dow Jones Industrial Average closed with a gain of 0.70% and closed at the high of the day. The blue-chip index created a medium sized candle extending a move above the long-term moving average and looks bullish. The index is supported by the indicators but faces support near today's close so upward movement is questionable. A move above 25,250 may be bullish and could take the index up to 26,000 in the near term. The indices are creeping higher and that is a good thing. The bad thing is that the move is more because a slackening of headwinds thanan increase of tailwinds but better what we have than nothing at all. Not to say that improvement in trade, a Dovish FOMC, and better than expected aren't great because they are. The problem is that outlook for future growth continues to fade and, so long as that is happening, upward movement in the indices will be limited. I remain firmly bullish for the long-term, we're still in a secular bull market after all, but I am only cautiously bullish for the near-term.